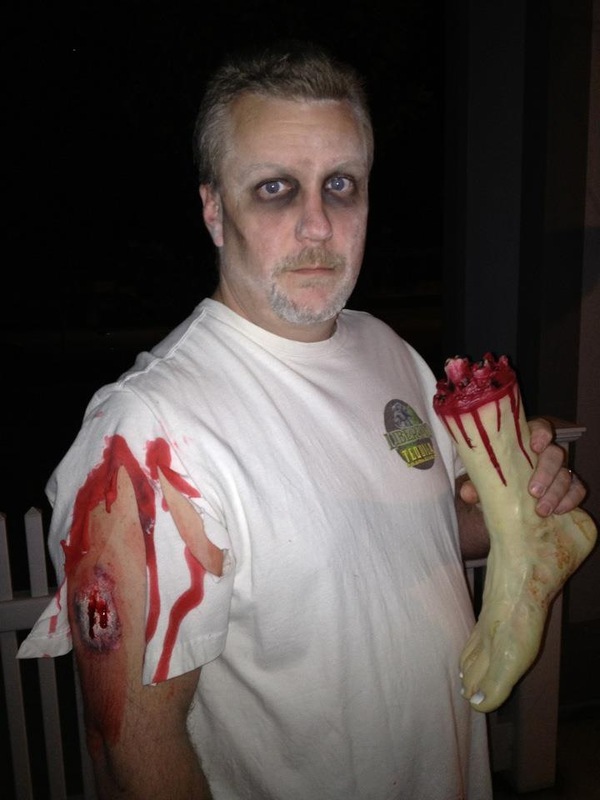 For the last few years my family has become interested in – no, obsessed with zombies. We gather together to watch Walking Dead every week. 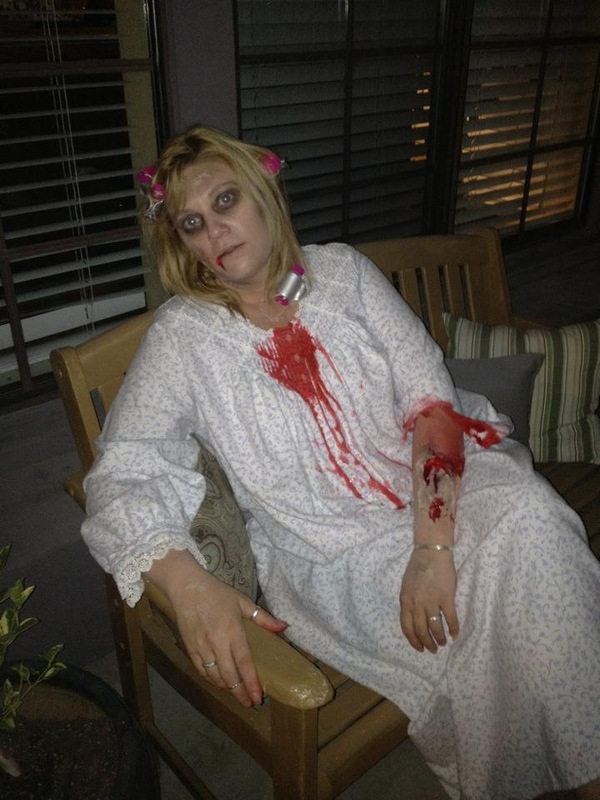 Our house is known as the ‘Zombie House’ among trick-or-treaters in our neighborhood. We even have endless discussions on how to survive the zombie apocalypse. I know many people must be thinking –Crazy- But, have you considered WHAT IF!?! Maybe, just maybe you should be prepared too. I apologize for this slap-in-the-face reality check for those of you that may not have picked up on the possibility that I may be a tiny bit nuts. In my defense, people that are kinda nuts make the most interesting of friends. If you’re local to the Manteca area, the Bass Pro shop may be a safe refuge. All the camping gear and weapons on the second floor at your disposal with only elevators and one staircase accessing it. Once you stock pile some food and block the staircase you should be safe – after all, zombies lack the intelligence to use the elevator. (sidebar: if you work at PG&E, please set the main electrical control switch to stay on, even without payment, at the first sign of zombies. Thank you.) However, many people will probably think Bass Pro is the place to go and the food will run out quickly, so have a back-up destination planned. But, in reality, (yes, I get the irony) you could just add The Zombie Survival Guide (get it here on Amazon) to your earthquake preparedness kit (and maybe a couple weapons) and nobody will notice and think you’re crazy. I recommend including wine in that kit as well, as I predict booze will become a top commodity in the zombie apocalypse. After a long day of zombie hunting we all need to be able to wind down and relax a little. Tip: Don’t forget the can opener and the cork-screw! I actually sought out this wine for the novelty value alone. I was extremely excited to find that the wine was way better than I expected! The Front Porch goers agreed. Caroline (our resident wine-snob) immediately said it was very good after the first sip. She said it was smooth and the color was clear & not cloudy. I quote, “one of the best Zins I’ve had in a long time.” She tasted blackberry & cherry and again said this is really good. Terry also seemed surprised at how good it was. She commented, ‘Oh! It’s really good and it smells really good!’ Arvin said it was bloody nice, he thought he noticed a peppery-ness to it, but he wasn’t sure if that came from the spicy meatball he just ate. Larry thought his mummy would really like it ;-p Becky said it starts fruity, like cool-aid, and Steve agreed. Joe said the flavor raises the dead. He also noted that he tasted strong Bing cherries and reported that it tasted woody –oak not cedar. 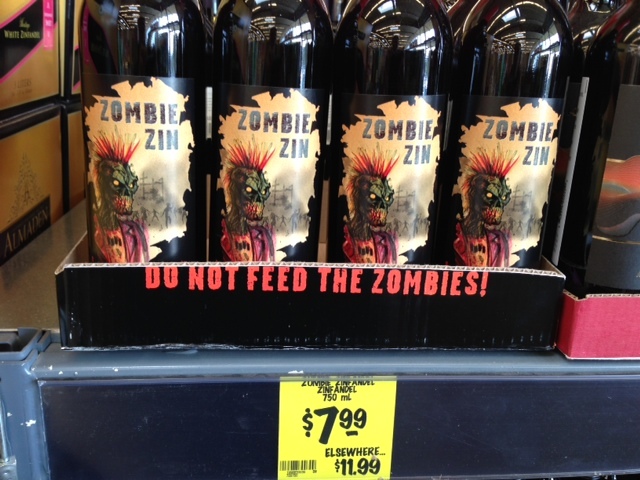 So, cheesy wisecracks aside, we finished ALL the Zombie Zin and most of us plan on getting more. Our first shipment was only 4 cases and it’s going fast, but I hear we have another 12 cases coming. Cellar Tracker gave it 87.5 points. On-line review: Really enjoyable zin. Nose is full of berry and spice. Jammy, like a mouth full of fruit; black cherry, plum, blueberry. Almost a creamy finish with some pepper poking through. Rich, but very pleasant, with a nice long finish. I would definitely buy again, even at a higher price. The label reads: As survivors of the apocalypse we have found refuge, hidden away from the world that was and from those who refuse to die. We pass the time making wine dreaming of better days gone by. The Zombie Zinfandel is blood-red in color. The aromas evoke visions of ripe blackberries and cedar coffins. The flavors meld together as an oozy mass of dark, ripe and horridly rich fruit with a layer of black pepper and spice. 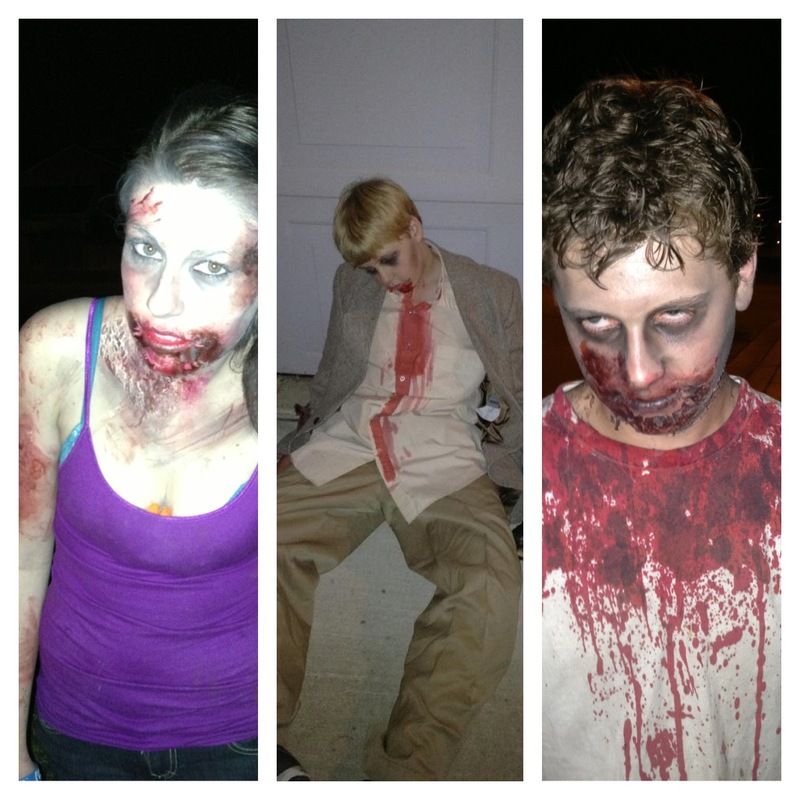 If you dare venture out and want to find us, look for the clues at chateaud.com/zombie. Be smart and stay alive. 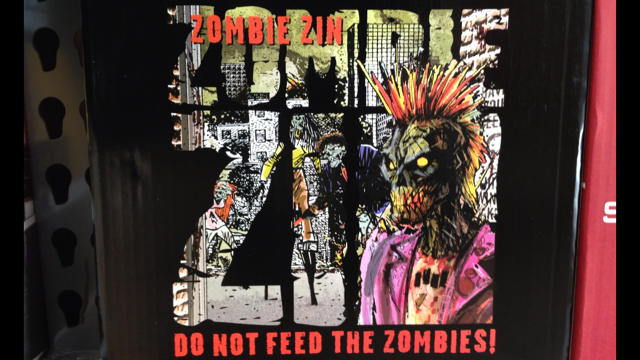 Click this link to enter to win your own Zombie Apocalypse essentials kit including: Zombie Survival Guide book, Zombie Zin and cork-screw.